The Laver Cup is a joint initiative between TEAM8, Tennis Australia, the USTA and Jorge Paulo Lemann and is supported by Founding Partner Rolex and Global Sponsors Mercedes-Benz and Credit Suisse. Thousands of fans turned out to the Palais Eynard in Geneva today as Roger Federer, 20-time Grand Slam champion joined Team Europe captain Björn Borg to launch the Laver Cup, which will be staged at the Palexpo, Geneva, from 20-22 September 2019. The pair toured Geneva as part of the global launch of the event as tickets sold in record time. “We’ve been blown away by how well received the Laver Cup has been already, firstly in Prague, then Chicago, and now here in Geneva with an incredible response to our ticket sales. I know the fans here in Switzerland will love it as well,” Tony Godsick, President and CEO of Team 8 and Chairman of the Laver Cup said today. “I’m so excited to be playing the Laver Cup here in Geneva, in my home country, it’s a dream come true,” Roger Federer said. “I’m super excited we have Rafa (Nadal) confirmed to play. We had a blast playing doubles together in Prague and it will be fantastic to team up together again and I’m sure Captain Borg will put together a world-class team alongside us. “One of the very special things about the Laver Cup, and I think the one that resonates most with both the players and the fans, is how we get to team up with our traditional rivals, those players we face across the net week in and week out on tour. Team Europe captain Björn Borg, renowned for his cool and composed demeanour both on and off the court, is also looking forward to the Laver Cup in Geneva. “This is a really special event and I’m determined to bring another incredibly strong Team Europe to Geneva in September,” Borg said. Federer and Borg’s big day out included a boat trip on picturesque Lake Geneva where Federer employed his famous serve to power up the iconic Jet d’Eau fountain. The pair had a social hit for the cameras at La Rotonde before heading to the Palais Eynard for a media conference and the chance to meet thousands of local fans. The Mayor of Geneva, Sami Kanaan and the Minister of Sport of the Republic and Canton of Geneva, Thierry Apotheloz were on hand to officially welcome the tennis superstars. “The City of Geneva is very proud to welcome champions such as Björn Borg and Roger Federer, who are role models for young players in terms of fair play and a beautiful game,” Mayor Sami Kanaan said. 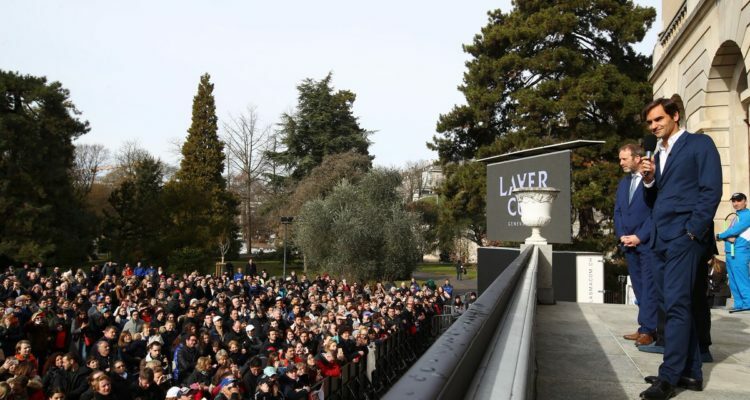 Twenty lucky fans also won Laver Cup ‘golden tickets’ from balls hit out to the crowd by Federer and Borg and eight local junior tennis players had the chance of a lifetime to meet their tennis idols. Laver Cup multi-session tickets have been snapped up quickly by tennis enthusiasts as the public sale opened today. “We are truly amazed and humbled by the unprecedented demand for Laver Cup tickets,” Laver Cup CEO Steve Zacks said. “The response has exceeded all expectations, with the current allocation of multi-session tickets exhausted at this time. We still have some hospitality packages available and we plan to release a limited quantity of single session tickets at a later date. Due to the overwhelming success of ticket sales and the high demand via Ticketcorner.ch, ticket availability is now limited. There is some hospitality availability via LaverCup.com/hospitality. In September 2018 more than 90,000 fans attended the Laver Cup at the United Center in Chicago,where Team Europe once again edged out Team World to win the second Laver Cup 13-8. This entry was posted in Laver Cup and tagged Geneva, Laver Cup.